Over the years the day after Thanksgiving has become a holiday of its own sort in our house—we call it Time To Haul The Christmas Stuff Out Of The Attic Day. It’s just as festive and exhausting as Thanksgiving. Just as messy, too. But this yearly ritual serves its own purpose, and that’s to unwrap a little magic to offset the drabness that can accompany November in Virginia. And sometimes, many times, I manage to unwrap some wisdom, too. By my count there are seventeen angels on my Christmas tree. Each are unique from the others in sort of a heavenly snowflake kind of way—tall and short, baby and adult, ceramic and paper. Some are new, products of last year’s Christmas-is-over-and-no-one-bought-this sale at the Hallmark store. Others, like the ragged piece of felt with one wing and half a halo, have been around since I was in elementary school. Our angels don’t simply grace the tree, though. They also flutter above our nativity scene, adorn our dinner plates, and stand guard in our front yard. These, too, have their tiny differences. Some are playing harps or blowing horns. Some sing. And some simply stand there with a stately and calm demeanor as if they have something important to say if I just took the time to listen. But regardless of what these decorations look like or what they’re doing, one thing is supremely obvious—they’re angels, and there’s no mistaking them. Others aren’t so easy to spot. I was putting the finishing touches on the tree Friday afternoon when I spotted something a bit odd. 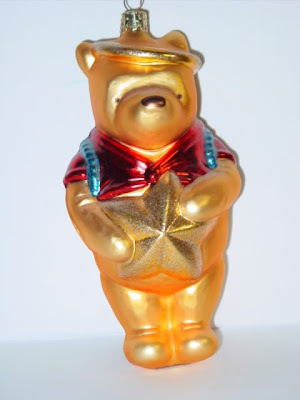 I pulled a Winnie-the-Pooh ornament out of the box and found it was not Pooh at all. One of the two miniature Coffeys in the house had evidently disrobed his trademark red shirt and dressed angel number eighteen with it. 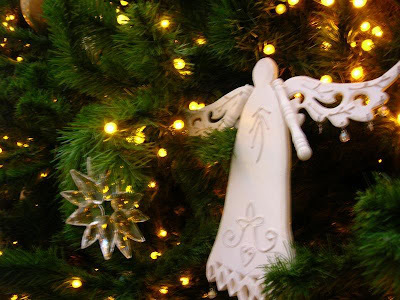 I left the shirt on and hung the angel on the back of the tree where no one would notice, and forgot about it. I went upstairs to write a while after that, first taking the time to go through a few emails. One was a continuing conversation that originated the day before by one of my online friends, who had taken a small part of her Thanksgiving Day to send a note of appreciation to a dozen or so of our shared acquaintances. The email bounced back and forth between all of us and seemed to settle on this one question—was what we all shared really considered friendship? It was a valid question. By and large we were all separated by hundreds and even thousands of miles. Few of us had ever met, never even heard each other’s voices. Our interaction was limited to blogs, Twitter, Facebook, and email. We were words and avatars more than flesh and blood. The consensus was that yes, we did share a friendship. Location and means of communication didn’t seem to matter. What mattered was what was said and when. That’s when I remembered the angel dressed as Winnie-the-Pooh. And when I realized what a real angel was. If you read the Old Testament in the original Hebrew (and I don’t), you’d find that the word for angel is mal’ach—messenger. No surprise there. But look a little deeper and you’ll find that word also used for anyone delivering any message. The thought is an amazing one. You don’t have to be a supernatural being to be an angel. You can be anyone. I looked back over all those emails and realized everyone had been wrong, at least when it came to me. Because I don’t see angels just at Christmastime, I see them on a daily basis. These men and women whom I’ve never met and never heard are more than friends, they’re my angels. They encourage me when I’m doubtful, make me laugh when I don’t want to, and lift me up in prayer. They’ve given me more help than I could possibly say. There are other angels, too. Ones who take the time not only to read the rambling words that pop out of my head, but leave a comment or two behind. Or who email me just to say thanks for making them laugh or think or even shed a tear. It seems pretty appropriate, then, that in this tiny window of time between Thanksgiving and Christmas I give thanks for my angels. We’re blessed every day, not so much with big things that matter much, but with small things that matter more. Which just might be why we’re called in the coming weeks to worship a child, the smallest among us. And which is also why I went back downstairs soon thereafter, took the disguised angel from the back of the tree, and hung it on the front.